PRINCETON, NJ -- The deaths of five police officers in Dallas, along with the recent deaths of two black men in Louisiana and Minnesota at the hands of police, highlighted -- again -- the importance of understanding attitudes of the American public, including blacks and whites, toward the police and criminal justice system. A review of Gallup data, all collected prior to these most recent incidents, provides a social and cultural context for these issues. Combined data from Gallup's annual update on confidence in institutions for the last three years (2014, 2015 and 2016) shows a 29-percentage-point gap in the percentage of whites and blacks who have a great deal or quite a lot of confidence in the police. Fifty-eight percent of whites have confidence in the police, compared with 29% of blacks. Despite these differences, the police remain the third-most-highly rated institution of the 15 tested by Gallup in early June of this year, behind the military and small business. 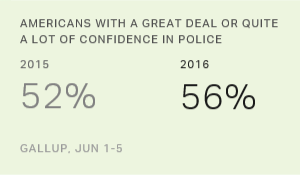 In that June survey, confidence in the police was up overall from the low point to which it dropped in 2015. The racial gap in confidence in the police is not new and has been evident throughout the past decade and a half in Gallup's measurement of confidence in institutions. A Gallup analysis of blacks' and whites' attitudes toward the treatment of racial minorities by police in 2015 showed that black Americans were divided in their views, with about half saying minorities were treated fairly in their community and about half saying they were treated unfairly. Over three-quarters of whites felt that racial minorities were treated fairly by police. A recent update for that question, based on interviewing conducted June 7-July 1, shows that these attitudes have not changed significantly. Blacks remain split, with 50% saying racial minorities are treated fairly and 48% unfairly, almost identical to last year. Whites' attitudes also remain unchanged from 2015. Significant majorities of blacks have historically perceived that blacks in their community are treated less fairly than whites in dealings with police, such as traffic incidents. The percentages ranged from a high of 73% of blacks who felt this way in both 2007 and 2015, to a low of 55% in 1998. This year's June 7-July 1 update shows little material change, with 67% of blacks saying that blacks are treated less fairly by police than are whites in their community. Whites typically have been much less likely to perceive minority mistreatment by police. This year's update shows that 40% of whites say that blacks are treated less fairly by police, up slightly from last year's 34%. Despite the general perception among blacks that they are treated less fairly than whites in dealings with police, black Americans have historically been relatively unlikely to report having been mistreated by police within the 30 days prior to being interviewed. These self-reports have not changed substantially over the past several years and are actually down from reports a decade or more ago. In Gallup's 2015 report, 18% of blacks reported that they could think of an occasion in the last 30 days when they felt treated unfairly "in dealings with the police, such as traffic incidents." That was similar to 17% in 2013. Data collected in this year's June 7-July 1 update also shows little change in this metric with 16% of blacks reporting such mistreatment at the hands of the police within the past 30 days. Black and white Americans have significantly different opinions about the honesty and ethical standards of police officers. An analysis of an aggregate of three years of data -- collected in December of 2013, 2014 and 2015 -- shows that 60% of whites rate the honesty of police officers as very high or high, compared with 28% of blacks. Overall, 56% of Americans highly rate police officers' honesty and ethical standards, putting police officers fifth on the list of professions tested, behind nurses, pharmacists, medical doctors and high school teachers. These five professions are the only ones for which a majority of Americans give high ratings of honesty and ethics. Americans, taken as a whole, have become more likely to say that the American justice system is biased against blacks. Between 33% and 38% of Americans said that the system was biased in surveys conducted in 1993, 2008 and 2013. 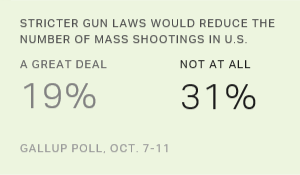 By last year, that number had risen to 47%, and it is at 49% in Gallup's just-completed update. Perceptions of bias have risen among both whites and blacks, although a large gap remains between these two groups. As of the June 7-July 1 survey, 76% of blacks say that the justice system is biased against blacks, compared with 45% of whites. A March Gallup report found that 35% of Americans said they are worried "a great deal" about race relations in the U.S., which as reported at that time was "higher than at any time since Gallup first asked the question in 2001." The percentage had been below 20% in measures from 2007 through 2014, rose to 28% in 2015 and hit 35% this year. An analysis combining responses from 2015 and 2016 shows that 53% of blacks say they worry about race relations a great deal, compared with 27% of whites. Even with the recent increase, however, worry about race relations is much lower than worry about a number of other issues and problems, including healthcare, the economy, and crime and violence. Between 5% and 7% of Americans have named race relations or racism as the most important problem facing the nation in the first six months of 2016. In June, race relations was tied with a number of other problems for sixth place on Americans' list of the most important problems facing the country. Blacks are significantly more likely than whites to mention race as the top problem. As reported in a similar Gallup review of American attitudes toward the police and race relations in 2014 after the death of Michael Brown at the hands of police in Ferguson, Missouri, there has been historically, and continues to be, a fundamental underlying gap in the ways in which whites and blacks view police in this country. That gap was evident in reactions of whites and blacks to the Rodney King trial verdict in 1992, to the verdict in the criminal murder trial of O.J. Simpson in 1995 and in on-going surveys conducted since that time. When and how this fundamental aspect of contemporary race relations in the United States can be addressed and solutions found remains to be seen. 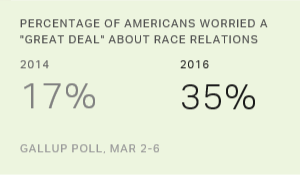 More than a third (35%) of Americans worry "a great deal" about race relations -- the highest percentage since Gallup started asking the question in 2001. This is up seven percentage points from last year and 18 points from 2014. 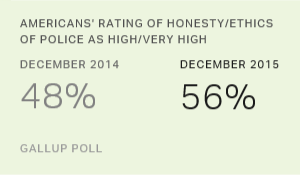 After dipping to 48% in 2014 amid a national firestorm over police treatment of young black men, Americans' rating of the honesty and ethics of police has rebounded to 56%. This rating is consistent with those between 2010 and 2013.